Faith is such an interesting word. It means “Confident belief in the truth, value, or trustworthiness of a person, idea, or thing. Or, a belief that does not rest on logical proof or material. “ I have cancer therefore I am going to die from it”. “ My family will always be there for me;” and many more varieties. For me from the very beginning of being told I had cancer I felt no fear. Now this is a big thing, the idea of getting cancer before this has hands down been my single biggest fear. However, sitting in front of the specialist and being told I had cancer I felt absolutely no fear. Sadness, loss, and confusion yes, but no fear! I am so amazed by this. However my faith always amazes me. Now if you do not have a faith in God, please don’t leave me here. I am not a weirdo, but I do have a very close relationship with God aka Jesus. I only came to have this relationship around 10 years ago. I was not born into a Christian family and found this relationship whilst searching for what was missing for me, as an adult after my son was born. Don’t worry, I am not preaching just filling in some background detail so you understand my perspective. I believe that God has a plan and purpose for my life (and for all of our lives). From the moment this diagnosis was thrust upon me I felt so strongly, “this will not take my life.” I honestly felt Protected by God. I don’t mean that He healed me instantly, but that by trusting Him, He will show me the way and that I am not on my own. So for me, I put my faith in God, and I believe that I will be ok. Now for me this means that I still get treatment from Doctors and the medical system and that I support my body with complimentary medicine and healthy lifestyle. Through this journey I believe I will be ok. So, answering my own question, faith is very important but just as important is knowing who or what you put your faith in. So no judgment either way, this journey is such a personal one, but I really feel compelled to share my journey with whoever is willing to read or listen. 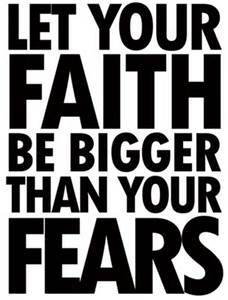 It is such a powerful question isn’t it, where, what and who do you put your faith in?